Are You A Victim of the Digital Marketing Skills Gap? "A skill gap is the difference between the skills required to complete a task and the actual skills possessed by an employee." While industries like manufacturing and IT have been hit hard by the growing skills gap, marketers have been impacted too. Boston Consulting Group recently partnered with Google to conduct a huge study about how the skills gap is affecting digital marketers. What they found is concerning. They asked 1,100 digital marketers to rank themselves on a 100 point Digital Capabilities Index (with 100 indicating best practice). 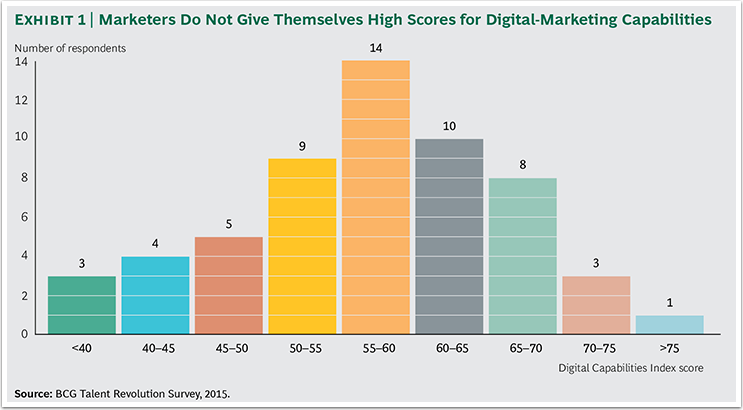 Shockingly, the average digital marketers ranked themselves at a 57. That should be a wake-up call to employees and businesses. The skills gap is very real, and if you have the foresight to eliminate your own personal skills gap, the benefits could be huge. Not a bad plan, right? So how can marketers ensure that the skills they have are the skills they need to be successful? Below is a three-step plan to closing your digital marketing skills gap. With some self-reflection and hard work, you can acquire the skills you need to be successful. 1. Identify your weak points. The first step to closing your personal skills gap is to identify your weak points. Be honest with yourself. This will be your blueprint for leveling up the skills necessary to stay relevant and grow your career. 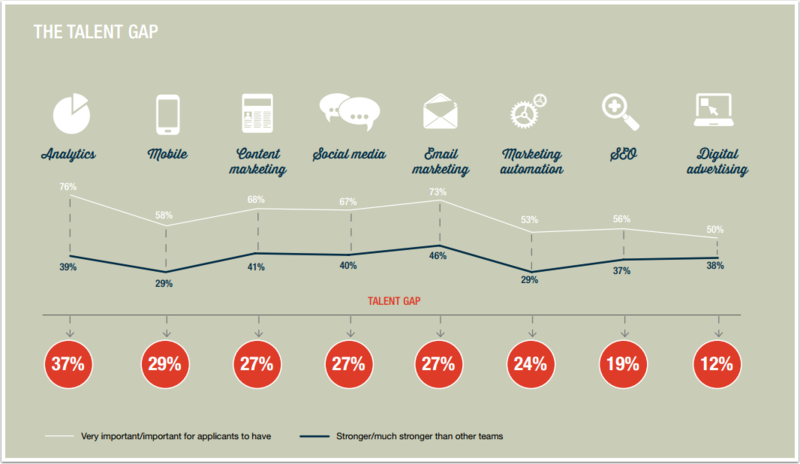 This chart from the Online Marketing Institute is a handy guide to the key areas of digital marketing, and how large the skills gap is in each category. Once you've identified your opportunities for improvement, it's time to develop a plan. Learning a new skill can be overwhelming. That's why the first place to start is a general overview of a topic. Try to find a certification course or comprehensive guide that is well regarded in that field. Some great examples are MOZ's Beginner Guide to SEO or HubSpot's certifications like the Contextual Marketing and Email Marketing Certifications. Do a quick Google or Quora search. Most likely, certain recommendations will appear again and again. Be wary of books - in the fast-moving industries that create skills gaps the knowledge can be out-of-date by the time it hits bookstores. 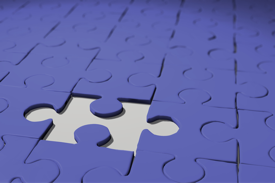 Once you know the subtopics, you can hunt down resources that provide specific best practices. Reading blogs, following experts on twitter, downloading whitepapers, and joining communities like Reddit, Quora and Inbound.org are all great ways to obtain domain-specific knowledge. The final step in closing your personal digital marketing skills gap is to practice. The hardest part of learning a new skill is going from learning (passive consumption of information) to doing (acting on knowledge contextually to achieve results). That's where a guiding hand can come in handy. If you're a HubSpot customer, a great place to look is HubSpot Projects. Projects are step-by-step resources that outline the tools and best practices needed to accomplish important marketing actions. They marry tactical execution and best practices to help you do the activities that will help you grow your business. Whether it's optimizing your conversion paths to generate more qualified leads or running a successful product launch, Projects can help you get the job done well. Taking the time to identify and improve your weaknesses puts you well ahead of the pack. Consider making it a yearly habit to assess the changes in your industry and what skills you'll need to stay relevant and thrive.